Breakdown: Right off the bat it must be said: for anyone in even slightly above-average shape, the Tough Mudder—a (roughly) ten-mile muddy romp of an obstacle course that takes place in cities across the world—should really be called the Fun Mudder. This new designation is in no way meant to diminish the challenge of the event (billing it as “probably the toughest event on the planet” is certainly overselling the difficulty, but it ain’t easy either); it is instead meant to highlight the surprising amount of unbridled joy and camaraderie you can feel while tromping through mud and getting a solid workout at the same time. 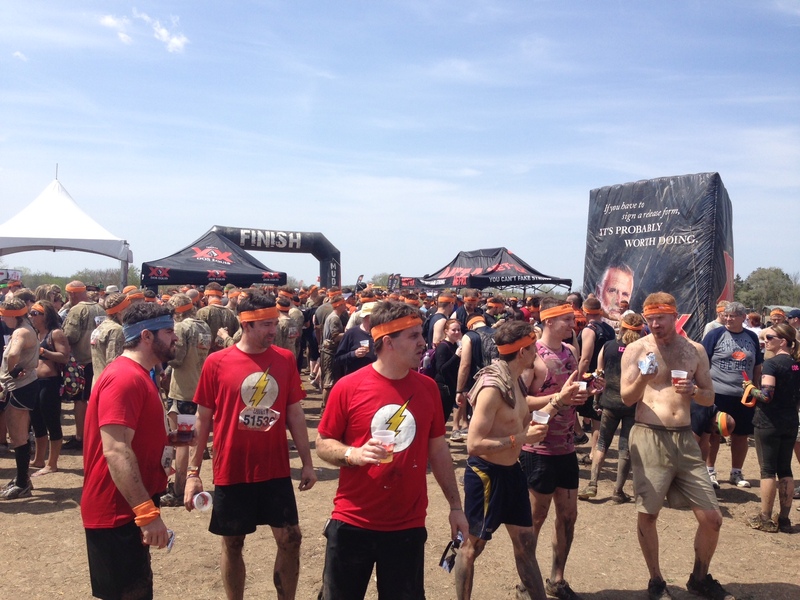 After experiencing Tough Mudder Chicago (which was actually in Richmond, Illinois) it’s clear that the phrase “Tough Mudder” doesn’t just refer to the course itself, although that’s obviously a big part of it. Instead, the title refers to the whole immersive experience of the event, from following their prescribed training regiments to riding a shuttle bus to the event to hitting a knee at the starting line while an announcer spends twenty minutes pumping you up for the race ahead to downing that first complimentary beer after crossing the finish line. The whole thing is undeniably an all-out great time. Yes, there are various challenges along the way, though most of them sound more intimidating than they really are. Among others, the “Arctic Enema” submerses participants in ice water, “Pitfall” sends you wading through a murky wetland with sudden drop-offs and “Berlin Walls” involves scaling tall, wooden structures. But while many of the obstacles may be more entertaining than trying (“Mud Mile” involves slithering up and over a series of mud mounds), there’s a mythologizing effect that sets in after you complete the Mudder and get your finisher’s shirt. In the parking lot after the event, discussing the course with some other participants (did I mention camaraderie? ), one guy said to the group, “Man, jumping off that thirty-foot platform was crazy.” He was referring to “Walk the Plank,” an obstacle that is essentially jumping off a high dive (probably around fifteen feet). For a few moments no one said anything. “I think that was probably closer to fifteen feet,” I offered. Another pause. “Yeah,” he said, with a wry smile, “I heard it was like 100 feet.” Yeah man, I heard that too. Course: Whether you’re pushing yourself to the limit or focusing more on team-building with a large group, this ten mile stretch of obstacle-laden earth will leave you with a weary grin. The obstacles are sturdy and well-designed with plenty of opportunities to get covered in mud sprinkled throughout. There are so many obstacles breaking up the distance that the running aspect is less pronounced than its ten-mile distance suggests. This course manages to be complicated and impressive without being dangerous. Organization (gear check, etc. ): From parking to shuttle bussing to check-in to water stations, the Tough Mudder organization has got the organization of this event on lockdown. They also charge you an additional fee at every step: parking ($10), gear check ($10), additional beer ($5). But for the fun they’re selling (both on and off the course) it’s worth the investment. Goodie Bag (includes shirt): A finisher’s headband (different colors depending on the number of Mudders you’ve completed, a nice finisher’s running shirt (I like the concept of doling out shirts only on completion of the race) and one Dos Equis beer. Not too much considering the price tag, but the post-race party is fairly epic.